You’ve asked for it. Today we’re delivering. 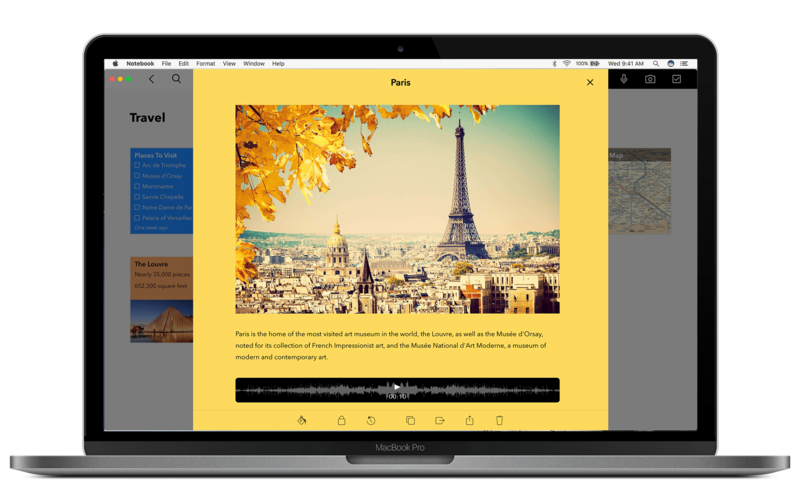 Notebook for Mac is here, our first desktop version. We’ve translated the concepts and design ideas that made our mobile app a success to the desktop. Plus we’ve included a bunch of nifty mobile-inspired gestures, and have optimized Notebook for Mac for the new MacBook Pro. The result: a seamless (and enjoyable) experience across devices. Our notebook and Note Card concepts created an elegant experience on mobile. We believe these concepts produce the same effect for Mac, giving you a clean and intimate place to think and remember. Create checklists and audio recordings and add photos with dedicated Note Cards; mix and match note types as needed with the Text Card. Personalize your notebook covers by dragging an image from your desktop onto a notebook. Notebook for Mac brings mobile-inspired gestures to the desktop, creating an intuitive experience. You can navigate the entire app with gestures alone; if you have a trackpad you never have to make a single click. Simply hover over a notebook or note and pinch to open and close them; or two finger swipe to see more information, lock, or delete notes and notebooks. When notes are grouped, use two fingers to flip through them. No other note-taking app has achieved this; it’s likely that only a handful of Mac apps have implemented gestures in this way at all. Notebook works with the MacBook Pro’s new Touch Bar, enabling contextual buttons within the app. 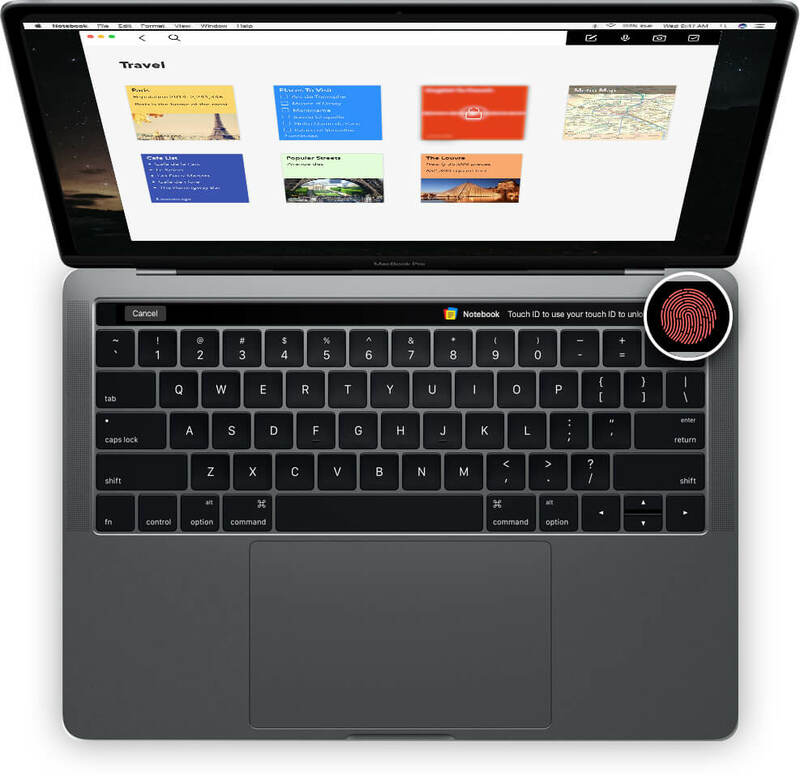 The Touch Bar can be used on the note card level; it offers formatting options in Text Card, start and stop recording buttons in the Audio Card, and more. You can even unlock notebooks and note cards with Touch ID. Don’t have a Mac? No problem. Our web app is on the way. We don’t like to commit to release dates, but you can expect Notebook for Web within the next couple months. In the meantime we encourage you to check out the Notebook Web Clipper, available for Chrome. We’re crafting the best note-taking app across devices. We’re designing, coding, and writing as fast as we can. You can download Notebook for Mac by clicking here. Hi! I was wondering if I can see previously made notes on the menu bar on the mac. Is that possible? Hey there, no you cannot. It’s just a way to quickly take a note. I cannot sign in my MacBook Zoho Notebook account but I can sign in my iPhone using my thumb. Hey Mike, we’ll check on this and get back to you. Hi there – What’s the effective difference between Notebook for Mac and Notebook for Web? Do they have the exact same features? Hey Seb, the Mac and web apps are pretty similar. The big difference is that the Mac app utilizes native gestures and some other functionality not available on the web. Also, the Mac app let’s you record audio notes. I use both regularly and have no problems taking notes and getting stuff done. 1- any plans for collaboration on notes? 2- some sort of sort by date/entry date and a calendar view would be perfect for journaling. any plans? Making the transition from Evernote, my suggestion is to keep it simple, Evernote is bloated, half of the “features” really aren’t needed… but I do need to import. Hope that tool is coming soon. Hey Mel, sorry it has taken so long for a reply. We do have an import from Evernote tool. You can find it in Settings. Just discovered this Notebook last month and I really like it, it’s exactly what I was looking for, i’m in the process of migrating to it from google keep. 2) The ability to draw or create custom notebook covers, some sort of simple blank covers that you can add text to would be ideal(not everyone likes the funky selection you have there). 3) Is there a way to export notes and info back out of the tool in a simple format? 4) Is there anyway to import from google keep? Hey Roger, thanks for your feedback. We will continue to do more with Siri. I believe Apple currently limits how we can use her. We have plans to do the custom covers. We don’t have exporting right now, and we don’t have importing from Google Keep. We will be releasing an import from Evernote tool soon. I am happy to know that there is a Mac version of Zoho notebook. I would like to try it but my computer is old. It runs OSX Yosemite, which is not supported. Will it be possible to support earlier versions of OSX? Hey I-ping. It’s unlikely that we’ll go back and support old versions of MacOS. I was wondering are you guys planning to release a desktop version for windows. You can’t get ahead ignoring windows platform. By the way love your mobile app and hoping that you guys will release a windows version soon. Hi there, yes we’re working on a Windows version. Right now we’re focusing on the Notebook for Web; once that is done we’ll get the Windows version as soon as possible. I was just wondering, do you also have a plan for a windows version of Zoho notes? I know you talked about a web version, but I prefer working in a downloaded notebook software (like evernote), rather than relying on my browser. Yes, Notebook app for Windows is also getting ready. We are now currently working on Notebook Web version. Once the web version is live, we will completely concentrate on Windows version and make it live as soon as possible. If you would like to use the beta version of Windows Notebook app, please share us your mail ID to support@zohonotebook.com, so that we will send you the beta version app, once it is available. Discovered your mac and iOS notebook apps recently. Enjoying it so far. If it’s alright, can we request for ‘outline’ type text/checklist cards? One where we can collapse and expand lines of notes? Would be really great for mind mapping ideas and grouping lists. Secondly, would like to be able search for text in the text or checklist level. Hi there, those are great suggestions. We have plans to add more note card types. The outline idea is certainly cool and we’ll look at how we could do that. We’ll also look into searching at the note card level. Thanks Taylor. Certainly looking forward to the app updates. We are waiting for the web version and a windows desktop app. I am enjoying notes on my android but facing the issue to be able to continue my work on my laptop. And also we can’t access notes on laptop for future use. This is where we are unable to leave evernote and adopt notebook as our primary writing app. Hey Izzy, yes, you can retrieve deleted notes by clicking File in the menu bar, then Trash. Choose a note or notebook you want to retrieve, then hit Recover. Will there be a web clipper for Safari? Hey Simon, yes there will be. We can’t commit to a release date, but it’s something we’ll definitely do. Just don’t forgot RTL languages – e.g. Arabic and Hebrew – same as Evernote! Hey, such a nice app. 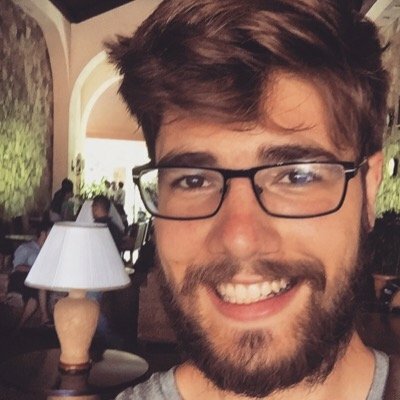 Even if I don’t have a Mac, I can understand how hard it is to build tech products. I love the user interface. Congratulations! Hey Paritosh, we’re glad you like it. Thanks for your kind words. Thanks for great app! Goodbye Evernote! Would love to see possibility to drag PDF, Word-files to the notebooks in upcoming versions. Thanks for a great app! Goodbye Evernote! Suggestion for future versions: Possibility to drag PDF, Excel-files etc to notebooks. Very cool, I am throwing away my legal pad as I type this! AWESOME! Very cool. However, can you share the notes? Sharing notes is a big thing for us. Hey Robert, glad you like it. You can share notes through email, Twitter, Facebook, LinkedIn, iMessage, and more. I was thinking more of a live share. As in we can share notes and see changes in real-time. Today we use Google Notes and it has real-time sharing. Will you guys be offering that in your web version? Thanks for the clarification. Yes, we have plans for real-time sharing.